The Victorian Coalition Government has sold 2.6 hectares of land to Tatura Milk Industries (TMI) Ltd to help the company maintain production of high quality dairy products. TMI — which produces 80,000 tonnes of dairy products annually — had outgrown its existing facility, and the adjacent land it acquired with the help of the Victorian Coalition Government will allow it to continue to grow and prosper on the local market. According to the media release by the Premier of Victoria, Deputy Premier and Minister for Regional and Rural Development Peter Ryan was joined by The Nationals candidate for Shepparton Greg Barr and Member for Shepparton Jeanette Powell during his visit at TMI’s Hogan Street factory on Thursday. “TMI’s current factory was operating at maximum capacity, and any plans to develop the facility could only proceed once nearby land was secured. To ensure it could continue to grow, the Coalition Government sold 2.6 hectares of neighbouring surplus railway land to TMI,” Mr Ryan said. Mr Ryan said the Coalition Government has also worked with the Greater Shepparton City Council to rezone the surplus railway land, as well as other nearby land purchased by TMI, to a Special Use Zone dedicated to milk processing, ensuring that future development can proceed without delay. Mr Barr said The Nationals were fully committed to supporting local manufacturing businesses as well as the region’s farmers. “TMI are vital to the local economy, employing 435 full-time employees and contributing $163 million per year to local farmers through milk payments. TMI is the largest private label cream cheese and infant formula manufacturer in Australia and produces a variety of products including milk powders, cheese, cream cheese, infant formula and milk protein concentrate,” Mr Barr said. Mrs Powell said the Coalition Government’s hard work and support meant TMI had a bright future in Tatura. 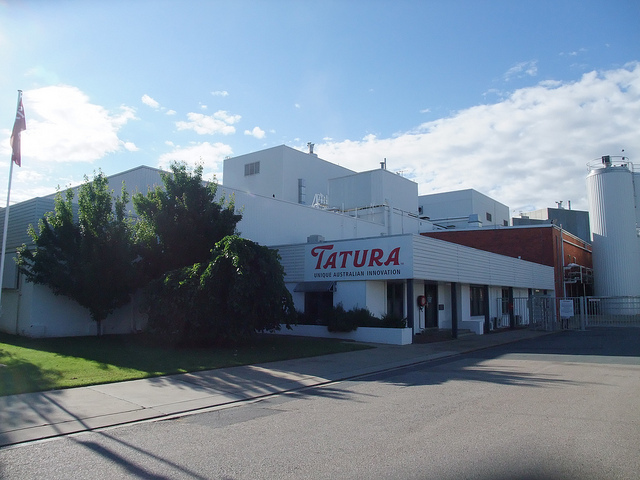 “Tatura Milk Industries, which started out as the Tatura Butter Factory and Farmers Produce Company, has been operating out of its Hogan Street facility since 1907,” Mrs Powell said.